3. Two screws (more RED arrows) hold the back down. 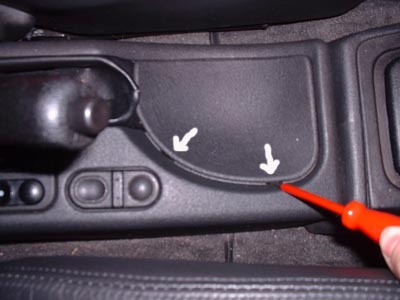 Once undone you need to unclip the handbrake gaiter, I did this by gently pressing inwards with a wide flat bladed screwdriver. There are several clips to undo and it’s fiddly. 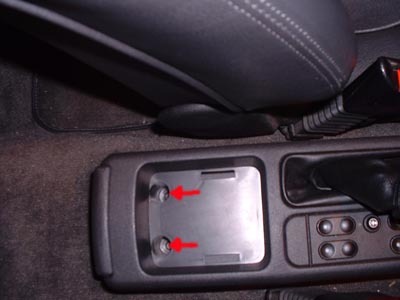 Don’t be tempted to force them, otherwise they’ll easily break L Lift off the whole handbrake surround panel, not strictly necessary but you will struggle to cut the coin holder out without doing so. Cut the coin holder very slowly. You need to keep a flange for the switch to sit against. The ends of the hole should be filed to match the clips at each end of the switch. Once the hole is cut, fit the switch with the raised button at the rear and begin re-fitting the centre trim panel. Leave all of the screws out for now, as you need to plug the switch in BEFORE it goes down fully. 4. The wiring connector shell is visible. The wires going forwards are part of the loom, those going backwards (hidden in the pic) are for the window switches and FC control switch. A metal locking bar holds the connectors together. 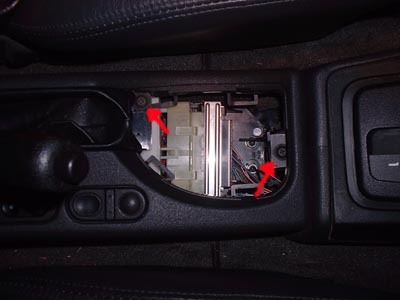 It won’t lift up fully until the centre handbrake surround has been lifted and the white spacer (bottom) has been removed. Lift the metal bar up, from the front edge and over the top of the connector block. 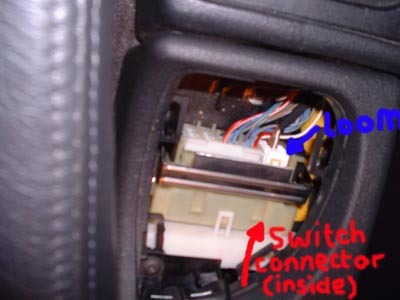 The connectors part automatically. Any questions, problems, mistakes and other complaints etc should be sent to Ian. All of this information has been prepared and presented in good faith, but the author can not be held responsible for any injury or damage that occurs as a result of either following the procedure detailed, or any failure to do so. Working on cars is not to be taken lightly. 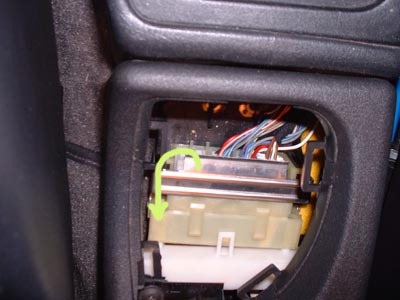 Even seemingly minor damage to other systems within a vehicle could render it unsafe for use on the road, so be very sure of what you are doing and leave anything you are not 100% confident about to a qualified engineer.